How to watch the World Cup Final in 4K Ultra HD on BBC iPlayer | What Hi-Fi? The latest 4K Ultra HD iPlayer trial comes to an end on Sunday with France meeting Croatia in the 2018 FIFA World Cup final. The BBC has been broadcasting its matches in Ultra HD and High Dynamic Range (HDR) on iPlayer. So, how can you watch? Well, you'll need a compatible TV (or other devices) and a suitably high-speed internet connection. And you'll also need to be a rapid responder, as it won't be available to everyone. Read on for all the details. 4K iPlayer: what can you watch? All 29 of BBC One’s World Cup matches have been available in 4K Ultra HD and High Dynamic Range (HDR) - and now there's one more left on iPlayer in 4K. Previously the BBC has delivered 4K iPlayer trials of live Rugby League and FA Cup football, and it's currently serving up the Wimbledon tennis tournament in 4K too. Both the World Cup final and Wimbledon Championships trials are "first come, first served". The Ultra HD stream is available from the BBC iPlayer home screen when coverage begins and until the trial is full for that broadcast. The BBC has said the trial is available to "tens of thousands of people". We know the recent 4K iPlayer trials have been centred around "stress-testing" the service - checking how many people it can handle streaming 4K video at the same time. The 2018 FIFA World Cup kicked off on Thursday June 14th at 4pm BST, and these are the BBC One matches that are (or have been) available in 4K on iPlayer. The trial is streaming on BBC iPlayer over the internet but you won't be able to watch on your standard web browser and computer monitor. You'll need a compatible 4K TV. The full list of compatible 4K iPlayer TVs is here, and it includes 2016, 2017 and 2018 LG TVs, 2017 and 2018 Samsung TVs, plus TVs from Loewe, Panasonic, Philips, Sony and more. The list appears to be fluid, so it's worth keeping an eye on. There are some notable absentees, including Samsung's 2016 TVs which, though they do support HLG, don't support DVB-DASH, the technology standard behind the BBC's adaptive streaming. Similarly, Sony's 2017 A1 OLED isn't on the list, nor are a vast chunk of Sony's 2016 and 2017 line-up. If you have a 4K TV that isn't on the list, you do have the option of the Virgin TV V6 box, Roku Streaming Stick+ or the Sony PS4. Interestingly, there's no support for live 4K iPlayer broadcasts on Sky Q, even though the Sky Q platform supports on demand (rather than live) Ultra HD iPlayer content. We're still attempting to clarify that with the BBC. As well as the TV, you will also need a fast enough internet connection. The BBC recommends people will need an internet connection of at least 40Mbit/s for the full 3840-pixel Ultra HD resolution, and recommends a wired connection rather than connecting over wi-fi. The iPlayer trial will deliver 4K and HDR video. The BBC will use the Hybrid Log-Gamma version of HDR, which the corporation invented along with Japanese broadcaster, NHK. It promises to provide better picture quality not only to HDR Ultra HD devices, but to the vast majority of Standard Dynamic Range Ultra HD devices too. So even if your TV doesn't support HLG HDR, you should see a benefit. The BBC is using adaptive bitrate, which means the quality of the picture will vary according to the quality of your internet connection. The highest quality is 3840 x 2160, at 50 frames per second. If your connection isn't fast enough, the picture resolution will decrease. The BBC says at 20Mbit per second you'll get 2560 resolution video, and it'll drop right down to 720p HD if required. 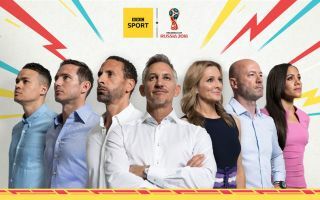 So, while we've all thoroughly enjoyed the World Cup in 4K on the BBC, we can't help but already think about what will come next and whether the BBC will continue offering 4K broadcasts on a regular basis. The BBC has said it will be using the experience and data gathered from the trial "to optimise UHD delivery in the future". The trial will also help "the BBC and wider industry prepare for a time when delivering such large-scale events in such high quality, for larger audiences, over the open Internet is normal," said a BBC statement. Also part of the UHD trial list is the 2018 Wimbledon Championships (live now until July 15th) and conditions for the 4K iPlayer stream is the same as the World Cup -at least 40mb/s stream, and it'll be on a first come, first served basis. The tennis tournament overlaps with the World Cup (especially the final) so it'll be interesting to see how BBC handles the two big event streams. As for the rest? BBC also currently broadcasts FA Cup football, Six Nations rugby, rugby league, snooker, athletics and plenty more, as well as the Olympics. So can we expect to see them all in 4K in the future? It certainly looks much more likely now.